I posted this book before and it’s come up free again. If you missed it last time, get it now while it still costs $0. I read it and loved it. Imagine having a drink or two, or too many, with some of literature’s most famous dead women authors. It’s a funny and informative read. 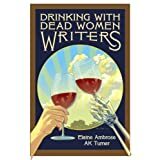 Essays on drinking with Louisa May Alcott, Jane Austen, Erma Bombeck, The Bronte Sisters, Willa Cather, Emily Dickinson, George Eliot, Margaret Mead, Edna St. Vincent Millay, Margaret Mitchell, Carson McCullers, Flannery O’Connor, Sylvia Plath, Ayn Rand and Virginia Woolf. Most early female writers used pen names because women weren’t regarded as competent writers. Margaret Mitchell wrote only one published novel in her lifetime, but Gone with the Wind won the Pulitzer Prize for Fiction in 1937 and sold more than 30 million copies. Emily Dickinson was so paranoid that she only spoke to people from behind a door. Carson McCullers wrote The Heart Is a Lonely Hunter at age 22. Her husband wanted them to commit suicide in the French countryside, but she refused. Ambrose and Turner explore these and other intriguing facts about the most famous (but departed) women in literary history. This entry was posted in Kindle Bargains and Freebies and tagged Books, Drinking, Free, History, literature, Women, Writing by Lori Saltis. Bookmark the permalink. This looks really interesting. Downloaded it – can’t beat the price. It’s one of those books that I downloaded for free and would gladly pay for. It looks like it’s part of a series. I hope so. Can’t wait for the next one. Enjoy!